Lock in a great price for Leonardo Hotel Berlin – rated 8.5 by recent guests! Friendly staff, good location , restaurant around Perfect!! Location was great with underground trains just round the corner. Breakfast was excellent. Concierge was extremely helpful with information on travel, details on how to get there and recommendations on where to eat. Good place for all, who want to visit Messe in Berlin. Good place, worthy of the value of money, standard services. Not fantastic, not bad. The breakfast we haven´t had a chance to use; it was from our decision. But next to the hotel are more small coffees bar, where you can both eat and recognize an atmosphere of Berlin streets. Standard Double Room was very small but adequate for a night stay for a couple. On Sunday night street parking is available and free otherwise parking garage is available at an expensive price. Subway station is a quick 10 min walk making getting around Berlin easy. Breakfast was amazing. Lots of choices and fresh. Airport was about a 30 min drive with rush hour traffic on a Monday morning. Good value for the price in Berlin. The hotel has a good location, close to Tegel Airport, close to a metro station and it has good places to eat around. Clean. Great location, close to U. Shops nearby . Friendly helpful staff, Great breakfast. Comfortable beds. The restaurant is top notch for breakfast and the coffee is very good. The area is very good around the hotel with some excellent restaurants and shopping is close by. They have parking for autos. Bed very comfortable. Location of room , facing courtyard with lots of sun. Quiet, despite being full. Great breakfast, perfect location to visit our daughter. Leonardo Hotel Berlin This rating is a reflection of how the property compares to the industry standard when it comes to price, facilities and services available. It's based on a self-evaluation by the property. Use this rating to help choose your stay! One of our top picks in Berlin.This 3-star-superior hotel is located in Berlin’s Charlottenburg district, between Berlin’s Exhibition Center and the Kurfürstendamm shopping street. All rooms at Leonardo Hotel are air-conditioned and have a flat-screen TV. An optional rich buffet is served between 06:30 and 10:30 every morning in the Leonardo’s colorful breakfast room for an additional charge. Guests can also enjoy drinks and snacks in Wilma’s bar/lounge with its chic modern interiors. 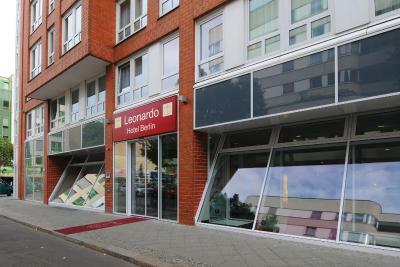 Leonardo Hotel Berlin is 350 feet from Bismarckstraße Underground Station, which provides a direct connection to Potsdamer Platz and Alexanderplatz. It is also a 5-minute walk from busses to Tegel Airport. When would you like to stay at Leonardo Hotel Berlin? Spacious, air-conditioned room with 40 inch flat-screen TV and tea/coffee facilities. 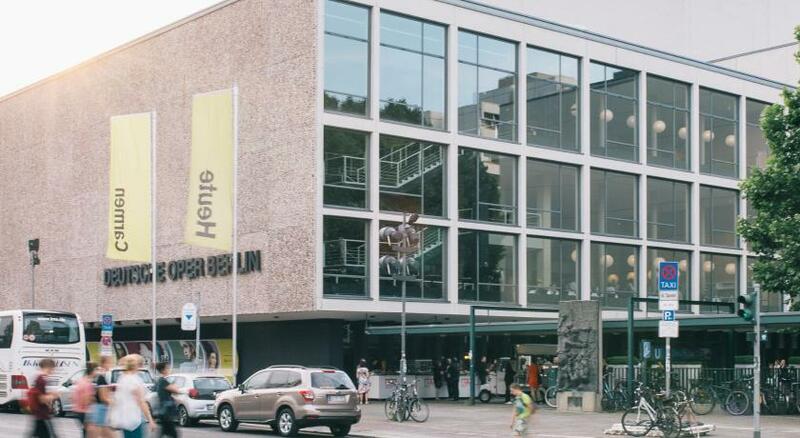 The Leonardo Hotel Berlin is located in the heart of Berlin and due to its superb location and great links to Berlin's exceptional public transport, it attracts business guests and city visitors alike. House Rules Leonardo Hotel Berlin takes special requests – add in the next step! Leonardo Hotel Berlin accepts these cards and reserves the right to temporarily hold an amount prior to arrival. Guests younger than 18 years must be accompanied by an adult in order to check-in. We had an issue with power in the room ( a fuse blew because of the lamp and we had no electricity at all for hours). This issue was solved after 2 or 3 hours, people helping us seemed to be totally lost. The location was pretty good, close to subway, Charlottenburg Palace and many restaurants. Mattresses a little too soft for my liking, douvet a little small. Everything else was top notch. Evacuation one day due to technical issue. The attitude of some employees. You have to pay immediately at the arrival wich is mora a hostel-kind-of-policy not a 4**** hotel. We had some problems with the credit card and they just said "if you do not pay, you can't check in." Luckily we managed the problem by ourselves, but this was not a warm welcome nor a helpfull one. Really clean and comfortable room, coffee&tea for free in the room, good location close to Kudamm and ZOO, also close to the u-bahn. Nice neighbourhood with lots of dinning options. Really close to the underground stop and very easy to get all around Berlin. The barman was lovely and the staff were really helpful.